Big news! I've begun writing reviews for Modern Guitars Magazine. Anything I write for them will be exclusive to their site for a couple of weeks, after which I can post the review text here or elsewhere. Modern Guitars is an excellent site, and I'm thrilled to be able to contribute to it. My review of the Uncle Moe's Space Ranch - "Moe's Town" album has just been posted. Check it out! Review: Uncle Moe's Space Ranch - "Moe's Town"
The new album by Uncle Moe's Space Ranch, Moe's Town, has been released by Tone Center Records. 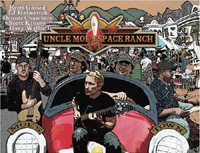 The Uncle Moe's Space Ranch band features Brett Garsed and T.J. Helmerich on guitars, Scott Kinsey on keys, Gary Willis on bass, and Dennis Chambers on drums. The album was produced by Garsed and Helmerich, with Helmerich also handling the engineering and mixing duties. Moe's Town is a follow-up to the band's self-titled 2001 release, and its originality and depth are stunning. The music on this disc is hard to describe. This is not a typical fusion record by any means. Imagine if Buckethead joined Tribal Tech and you'll start to get the idea. The music is a conglomeration of techno beats, funk grooves, industrial rhythms, metal riffs, samples, loops, cool chord changes, and loads of great guitar playing. Helmerich's engineering and mixing job is so instrumental in the final result, that it's sort of like a sixth band member (it should be noted that Helmerich's students at RIT, the recording school at Musicians Institute in Hollywood, assisted with the mixing). The result of this crazy mash-up of styles and sounds is one of the freshest fusion albums I've heard in a long time. And fear not - even though Moe's Town is chock-full of effects and samples, this album is not a sterile "studio creation"; all of the band members' individual styles are very present here. There are great guitar solos everywhere, and the contributions from Willis, Chambers, and especially Kinsey are unmistakable. There are some guest appearances as well: Bassist Ric Fierabracci and drummer Virgil Donati are along for the ride, and Djemel Chergui is credited with Electronica. Garsed and Helmerich are best known for their unique and unmatched playing styles - Garsed uses Holdsworth-style legato plus hybrid-picking (which combines picked notes with notes plucked with the right hand fingers), whereas, Helmerich uses 8-finger tapping. Both techniques could fall under the umbrella of "legato", which is one of the reasons these 2 players complement each other so well. Garsed and Helmerich have recorded together many times since they first teamed up for the fantastic Quid Pro Quo album in 1992. Moe's Town, however, is a radical cornucopia of music unlike anything they've ever done. The opening track, "Valentime's Day", really sets the mood for the whole album. After several sections that vary in style from techno metal to God-knows-what, the song suddenly shifts gears into jazz territory with a great Scott Kinsey solo. Garsed's solo is next, and it's one of my favorites on the album. His fast runs flow seamlessly over the 2-chord progression. The song closes with a Helmerich solo over a different section than Garsed playedover. Helmerich's soloing has evolved over the years. His phrasing is more introspective and dynamic now than it was when he first broke on the scene long ago. The ultra-fast two-handed runs that once dominated his playing are still there, but they take a back seat to the unique, almost herky -jerky phrasing he now employs. He sounds less like a guitar player who taps, and more like a musician who's using a one-of-a-kind instrument that only he plays. Next up is the title track, "Moe's Town", a 10 minute deep-grooving funk piece with a strong blues influence. There's a lot going on in this tune. Garsed plays some nice bluesy lines early in the song, and shows off his slide-guitar skills later on. I love Willis' bass solo on this one too. "Ella's Hotel" has one of my favorite melodies on the album. About halfway into the song, after a crazy outside, atonal solo from Garsed, a beautiful chord-melody is introduced that you can't get out of your head. Helmerich's solo at the end of this tune is arguably his best on the album. "Audio Rhumba" has a slight Latin influence, and features some nice trading off between Garsed and Helmerich. Willis' bass work really stands out here also. "Dad's Speakers" is a fun uptempo tune that has shades of Tribal Tech. Like "Moe's Town", this is another song that gives you a lot to listen to. "Inspired Weak" is another strong track, and features Garsed's best solo on the album. Helmerich surprises us with his solo on the next song, "Snout! "; he uses no tapping at all. It sounds like a completely different player, but the liner notes confirm it's him. His playing here has a definite Scott Henderson influence, which doesn't come through as much when he taps. The next song, "Path to Aesthesis", was written solely by Kinsey. This song has 2 distinct parts. Gary Willis plays bass on the first part, which sounds very much like late-model Tribal Tech. The piece then morphs into a different groove with Ric Fierabracci on bass, and a crazy solo by Helmerich. The only song that didn't do it for me is the final track, "Nitro squirrel (multiple moe)". It's essentially a long drum solo, courtesy of guest Virgil Donati, with some heavy riffs and effects on top. You can tell Helmerich had fun mixing this one. Drummers will love this tune, but it wasn't my favorite. Moe's Town is one of those albums that really grabs your attention. This is a new kind of "fusion". It's also an album that keeps revealing more and more of itself the longer you listen to it. This is a rich album with lots to dig into. Fans of cutting edge guitar will be very satisfied with this release; Garsed and Helmerich really stretch out for some great solos here. So far, this is my favorite album of 2007. Highly recommended. Anyone who loved the first Uncle Moe should run out and buy this. Great weird fusion, fantastic playing!